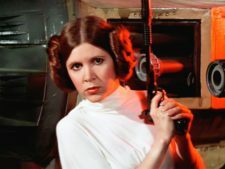 The company, which releases the “Star Wars” films, insured itself to the tune of $50 million in case Carrie Fisher couldn’t complete the filming of the new “Star Wars” trilogy. But let’s not forget that Carrie’s estate is also making money from her death (you know, death, which long ago Gore Vidal called “the best career move”). Carrie’s “Star Wars” memoir shot to number one last week.